Just when you thought it was about to fade away over the coming weekend, the saga of Jason Kenney's dubious House of Commons housing expense claims got a new lease on life yesterday thanks to a Liberal Member of Parliament from Ontario. Jennifer O'Connell, MP for Pickering-Uxbridge, breathed new life into the story with a formal request for an investigation into "the possible misuse of the Travel Status Expense Account by Mr. Jason Kenney, the former Conservative Member of Parliament for Calgary Midnapore and Calgary Southeast." And if you were thinking this was just some cranky Central Canadian MP tilting at a western windmill, you should probably think again. O'Connell is not just any MP. She is Parliamentary Secretary to Finance Minister Bill Morneau with responsibility for Youth Economic Opportunities. In other words, she's closer to the inner circle than most MPs, and she's been spotted as someone with political talent who has at least the potential for a cabinet post someday. What's more, her office ensured copies of her short letter to the Speaker of the House of Commons asking for the investigation by the Board of Internal Economy (BOIE), the committee that oversees expenditures by MPs, found its way into the hands of the members of the Parliamentary Press Gallery. I doubt this would have happened without a nod from the Office of the Prime Minister and Privy Council Building across the street. This is more, in my estimation, than a warning. If may not quite be open war, but it's certainly a message to Alberta's United Conservative Party that the government of Prime Minister Justin Trudeau is going to play hardball with them, even if the Alberta NDP won't. It's notice that that the Trudeau government has had enough of Kenney's relentless false claims that it is doing nothing to help Alberta build a pipeline to the West Coast and his frequent dark hints Trudeau is even trying to sabotage it, when they are spending literally billions of dollars and loads of political capital to achieve the opposite result. Despite the fact he's now a provincial opposition leader running for Alberta's top political job, Kenney has also not made much effort to hide the fact he views Trudeau, not Alberta Premier Rachel Notley, as his principal political rival, and that he covets the PM's job in Ottawa. Then there's that notorious and unintentionally hilarious Maclean's magazine cover in which Kenney identified himself with a group of Conservative premiers who are actively trying to use their provincial positions to manoeuvre the federal Conservatives into power -- a strategy from the U.S. Republican playbook hitherto not that common in Canada. So O'Connell's move yesterday was tactical -- her letter to Speaker Geoff Regan will keep the pot boiling under Kenney at a time he and his local media echo chamber are trying desperately to divert attention away from this issue. That may or may not help the Alberta NDP led by Rachel Notley, but it's unlikely to hurt them. However, that's probably not the primary objective. It's also strategic -- intended to ensure Kenney never realizes his dream of returning to Ottawa in triumph. Or, for that matter, that any other Conservative manages the same feat as long as Trudeau is around. So the first thing O'Connell's letter is intended to do, it is said here, is to deliver a sharp lesson to Kenney that he is not the only Canadian politician who knows how to play hardball. The Alberta NDP may have decided to be nice guys, and therefore risk finishing last while keeping their honour intact. But take note, the Trudeau Liberals are made of sterner stuff and if Kenney slams them, he's going to get slammed back. Starting now. The second thing it is surely intended to do is to neutralize Kenney as a threat to Trudeau and the Liberals in the mid-term, after they've finished with the hapless Andrew Scheer, the foundering leader of the federal Conservative Party. This may not work well for the Liberals in Alberta. They may even lose some or all of their four Alberta seats in the federal election expected next fall. But they will likely reap dividends elsewhere in Canada, where Kenney's noisy rejection of the idea of social licence for pipelines and sotto voce encouragement of the most extreme elements in his own party will not get him as much traction. "The second residence allowance exists so that Members of Parliament can both fulfill their Parliamentary responsibilities as legislators in the House of Commons and remain present in their constituencies to help and support the Canadians they represent," O'Connell stated in her letter to Regan. "However, it is important that this allowance be used fairly and properly. "Furthermore in an interview aired on CTV Calgary on January 22, the tenant of a neighbouring unit said 'He never lived there'," she wrote. 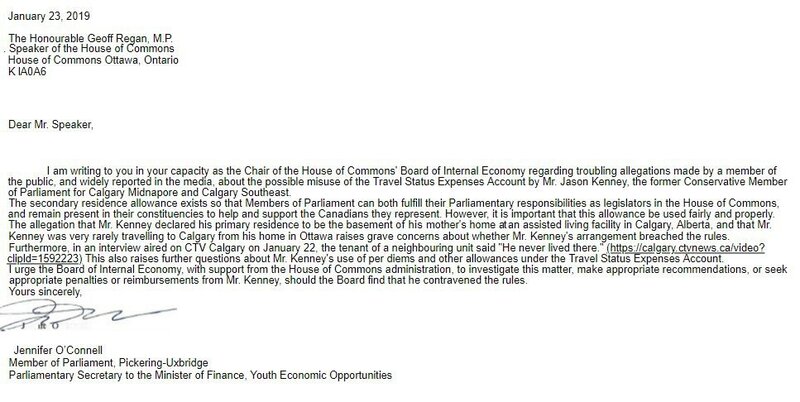 "This also raises further questions about Mr. Kenney's use of per diems and other allowances under the Travel Status Expenses Account." "I urge the Board of Internal Economy, with support from the House of Commons administration, to investigate this matter, make appropriate recommendations, or seek appropriate penalties and reimbursements from Mr. Kenney, should the Board find that he contravened the rules," she concluded. Government and NDP MLAs on the BOIE certainly have the numbers to make this happen with ease. The Liberals hold four seats and the NDP has one. The Conservatives have two. Kenney, naturally, stuck to his frequent talking point claim the federal Liberals and Alberta New Democrats are allies and that the allegations about his conduct are "sleazy, baseless accusations." His supporters among Postmedia's political columnists can be expected to join that barking chain today. But whether he likes it or not, this story now has legs. Kenney may have some 'splainin' to do after all, and, if he does, developments are unlikely to be timed to suit his campaign schedule.